Amelia is happily (most of the time anyway) enrolled in kindergarten. Monday they did awards for the first trimester. Amelia got one because she knows all of the letters and the sounds they make, and can identify them quickly. 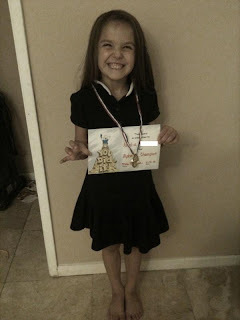 She was so proud of the medal she got. I love seeing her excited about school. Hopefully that lasts! I only had my cell phone with me at the assembly, so I didn't get any good pics of her getting her award, but she recreated it for me at home.